SmithGroupJJR is providing integrated planning, design and engineering services for the Aiya Napa Marina & Resort, a 70-acre mixed-use development offering luxury residences, world class yachting facilities and more on the southeastern coast of Cyprus. Rendering by SmithGroupJJR. Madison, Wis. — SmithGroupJJR, one of the nation’s largest integrated design firms, will now offer architecture services at its Madison, Wis., office for the first time in the company’s history. With 12 offices in the U.S. and China, SmithGroupJJR has provided a full range of professional services for large and complex projects across markets. The decision to offer architecture services in Madison — which has historically focused its practice on providing award-winning site design, landscape architecture, civil and coastal engineering expertise for a range of master planning, urban design and waterfront project types — supports strategic initiatives to expand SmithGroupJJR’s steady growth and positions the firm to better service clients and building owners that are increasingly opting to use multi-disciplinary firms to solve project challenges. Having a myriad of services — from master planning and architecture, to multiple engineering disciplines, landscape architecture and more — provided by a single, integrated firm allows owners to benefit from the creativity and heightened quality that such collaboration brings. “By expanding our service offerings to include architectural talent in Madison, we’re underscoring our commitment to become increasingly multi-disciplined and fully integrated,” said SmithGroupJJR Managing Partner Troy Thompson. At the Aiya Napa Marina & Resort, situated on the southeastern coast of Cyprus, SmithGroupJJR was commissioned by M.M. 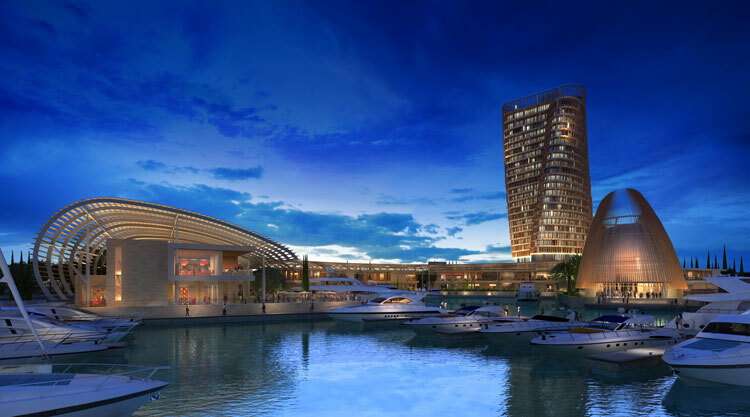 Makronisos Marina, Ltd, part of the Caramondani Group, to provide integrated planning, design and engineering services for a 70-acre mixed-use development, including a 600-slip mega-yacht marina, private villas, a working waterfront and boatyard, two contemporary high-rise condominium towers, a community event center, retail spaces, and luxury resort amenities. The initial stage of construction, planned to complete in June 2019, focuses on creating the marina’s robust infrastructure. Phase Two will focus on residential and commercial spaces and is scheduled for completion in October 2021. Chesapeake Bay Foundation’s Brock Environmental Center, Virginia Beach, Va. — This net-zero energy, Living Building Challenge Certified facility has been lauded as “a pinnacle of sustainability and resilience” for its many design and engineering accomplishments. University of Pennsylvania’s Stephen A. Levin Building, Philadelphia — This classroom and laboratory project brings together the university’s psychology, biology and behavioral sciences programs into an iconic facility and creates a gateway for the school’s newly-defined life sciences precinct. DPR Construction’s Phoenix Regional Office, Phoenix — Once an adult-themed boutique, this high-performance workplace is a living laboratory of green design and Arizona’s first commercial net-zero-energy office building.